Nearing completion the securing of the road linking the Bausher – Al Amerat districts in Muscat, the Omani capital. 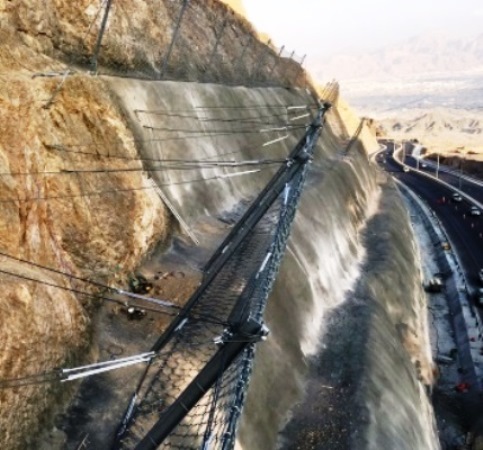 With the support of Maccaferri Italia, the finishing of the project “Construction of Slope Protection Repairs for Bausher – Al Amerat Road” is finally nearing. The overall length of the project is approximately 17 km, trenched through the orographic reliefs south of Muscat. The project, commissioned by the General Directorate for Roads conditions, has become increasingly necessary as a result of the many accidents that have occurred since the opening of the road in 2011. The works will end in June 2016 and took almost two years. The executed interventions secured the slope both through surface reinforcement with double-twisted wire mesh (placed approximately 80,000 m2 network) and riveted joints, and through works of passive defense like rockfall barriers. In particular, barriers were installed with a power tolerance level between 500-1000 kJ and 2000-3000 kJ. Since the road section is characterized by geomechanical complexity, a RMC 850/A rockfall barrier with a height of 9 meters has been installed. It has been tested and certified according to ETAG 027 (Guidelines for European Technical Approval of Falling Rock Protection Kits), with the highest performance in terms of energy absorption. The RMC 850/A barrier, subjected to full-scale tests according to ETAG 027 in the end of 2012, has been able to absorb the shock of a test block with a mass of about 19 tons, with an impact speed of 30 m/s (about 110 km/h), and a total kinetic energy exceeding 8600 kJ. Despite the high energy that is able to absorb, the RMC 850/A barrier is a versatile rockfall barrier consisting of a simple structure making installation easy even in complex scenarios, minimizing installation time and facilitating maintenance interventions.